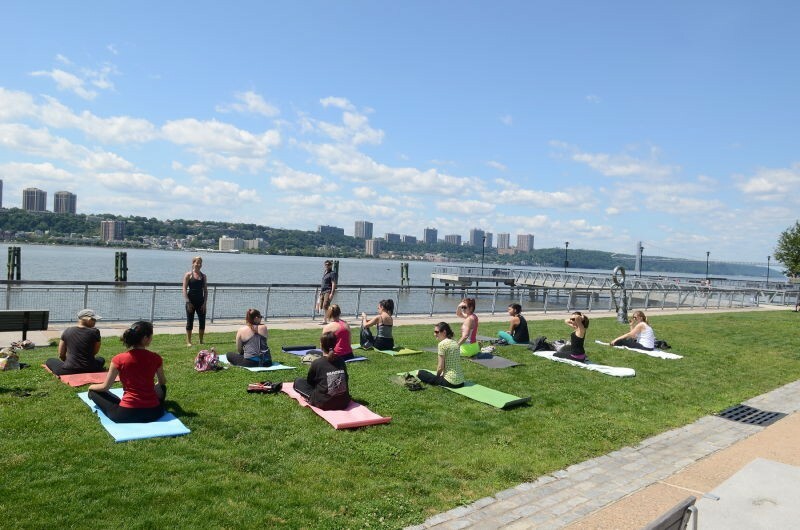 The West Harlem Waterfront Park is a landscaped transformation of the historic Manhattanville shoreline. For thousands of years, the natural topography of this site formed a valley and small sheltered cove off the Hudson River, also known as the North River. This solitary break between the bluffs of today’s Morningside Heights and Washington Heights provided the only direct river access to the area’s earliest native residents as well as a convenient inroad to the area’s early 17th-century non-native arrivals. This inlet was known as Moertje David’s Vly during the 17th-century Dutch colonial period, and as Harlem Cove under the English rule that followed in 1664. Annals of the American Revolution recall this as the “Hollow Way” where, under the command of General George Washington on September 16, 1776, the main action of the Battle of Harlem Heights ushered the valley into prominence. After the Revolutionary War, almost annual outbreaks of yellow fever in lower Manhattan in the 1790s coincided with the availability of inexpensive land in upper Manhattan, prompting many wealthy New York City merchants to build country residences along the scenic Hudson River cliffs. In 1806, New York’s waterways were still the most vital corridors for trade and travel. As a first order of business Manhattanville’s founders began adapting this uniquely situated waterfront into an expedient port. Led by wealthy merchant Jacob Schieffelin, local Quakers and other landowners also set about laying out the village’s streets, since the city’s street grid plan was still five years away from appearing on paper. The new streets bore such names as Buckley, Hemlock, Cove, Schieffelin, Lawrence, Effingham, Hamilton, Phineas, Byrd, Blackberry Lane, and Manhattan Street, which is today’s 125th Street. By 1808, regular ferry service across the Hudson River was established from Manhattanville to New Jersey and public advertisements informed of daily “conveyances to and from the city by water.” This route would be traced a century later as many of America’s early 20th-century silent screen stars ferried back and forth from this waterfront when Fort Lee, New Jersey, was a center of the film-making industry. The ferry was also the transport to the famous Palisades Amusement Park in Edgewater, New Jersey. By 1850, Manhattanville’s waterfront had become the convergence of river, stage and surface transportation lines. The first northbound stop of the new Hudson River Railroad at Manhattanville’s depot advanced the town’s growth as a railroad suburb within half an hour of the city’s business center. By 1890, the railroad station was one of the city’s largest freight stations, concentrating “the brick, lumber, and building material trade for the entire west side of the city up town.” This period of development also gave rise to the term “West Harlem,” which comprised the once distinct enclaves of Manhattanville, Hamilton Heights, Washington Heights, and Carmansville. On August 25, 1885, New York City’s first electric cable-car was tested in Manhattanville by the Third Avenue Railway Company, resulting in the city’s first cross-town line, from Harlem to Manhattanville. By 1900, the waterfront was dramatically framed by the Riverside Drive Viaduct above Twelfth Avenue, a feat of engineering that created a high-level boulevard extension of Riverside Drive over the barrier of Manhattanville valley to the former Boulevard Lafayette in Washington Heights. Nineteenth-century guidebooks frequently cited this waterfront village as a suburban retreat. In 1846, master engraver William Wade noted Manhattanville’s “convenient landing and wharf… containing about eighty houses, with five hundred inhabitants” in his exhaustive illustration of 150 miles from New York harbor to Albany along both shorelines of the Hudson River. In Herman Melville’s famous 1853 short story, “Bartleby the Scrivener,” the narrator sought rural escape beyond the city limits as he “drove about the upper part of the town… and paid fugitive visits to Manhattanville.” And in 1888 the Hudson River Day Line’s “Panorama of the Hudson” photographed some of the Manhattanville waterfront’s picturesque topography to be seen from an excursion steamer in mid-river. In 1897, the 129th Street Recreation Pier (at the foot of today’s St. Clair Place) was one of several two-story structures the city erected along the Hudson and East Rivers that were important extensions of the city’s park playground system. Improvements to the pier in 1899 made it also suitable as a dock for Catskill, Albany and Troy excursion boats. The city occasionally moored an additional public facility, Floating Bath No. 9, to the pier. Aimed to address public hygiene as well as swimming, the floating bath was one of about a dozen free facilities of similar design: a hollow squared pontoon of individual dressing rooms surrounding a 60’ x 100’ open tank. 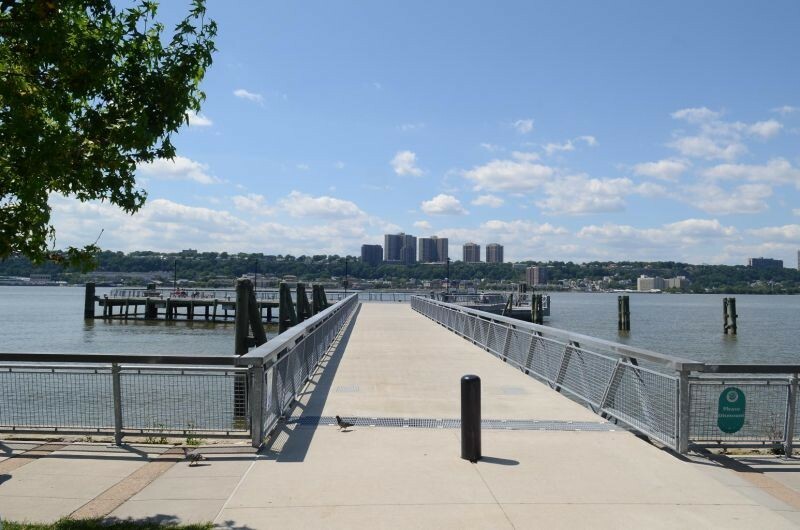 The 129th Street Recreation Pier accommodated over 1,500 people and housed various passive recreation activities including dancing, classes, and fishing. In 1911 the pier began offering weekly summer music concerts by a thirty-four-man orchestra conducted by Arthur Bergh. The pier was demolished in 1965. As we experience this waterfront today, the Hudson River is no less impressive than when J. Fenimore Cooper described “The noble river itself” from this shore in 1845, “fully three-quarters of a mile in width…unruffled by a breath of air, lying in one single, extended, placid sheet, under the rays of a bright sun, resembling molten silver.” The tranquil vista still evokes a sense of this area’s eventful past. Today’s newly developed landscape strives to make this historic waterfront into an enjoyable and compelling destination for a new era.